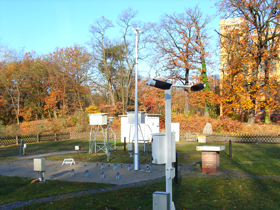 Meteorological parameters observed or measured, observation times and measurement techniques. Unbroken use of unchanged conventional measurement techniques maintaining a specific fixed observation procedures. (Unaspirated) measurement in a wooden open-air thermometer box at the above three observation times as well as hourly evaluation (thermograph). Determined from the wet-bulb temperature (simple aspirated psychrometer) at the above observation times, hourly evaluation (hygrograph). Determined from wet-bulb temperature (simple aspirated psychrometer) at the above observation times. Determined 5 cm above grass height. Direction, strength, peak speeds, momentary and daily values, hourly means. 10. complete snow cover, dry-fluffy. Record-time and daily totals, full-year operating precipitation recorder, hourly analysis of the registered measures between 1. April and 31. October. Continuous recording of all phenomena. Observation at the above three times, type and degree of cover with and without cirrus clouds. Development of snow cover, measurement of total snow depth and new snow depth at 7.00 hrs, determination of water content when snow cover is 1 cm or more deep. Daily measurement on an area kept free of snow. Daily measurement at 1.00 hrs, 7.00 hrs, 13.00 hrs and 19.00 hrs Central European Time at depths of 2 cm, 5 cm, 10 cm, 20 cm, 50 cm and 100 cm. Daily measurement at 13.00 hrs at depths of 2 m, 4 m, and 6 m.
On Mondays at 13.00 hrs measurement at 12 m depth. Site consecutively kept free of snow. Recording of hourly and daily sums. Sunshine recording by the Campbell-Stokes method using a yellow-colored sphere. Daily recording at the three observation times plus 3-hourly analysis. Characterization according to sequence of weather. 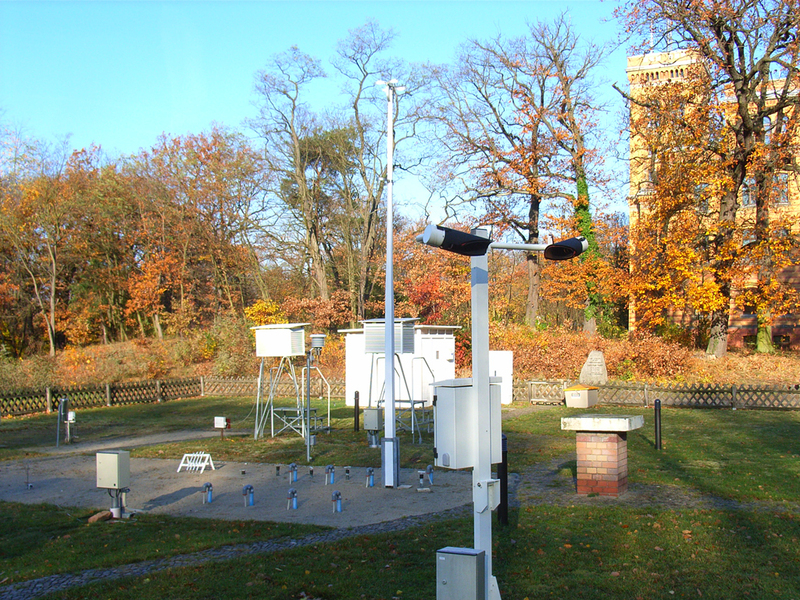 The usual observational program at weather stations, special observations of red sky and afterglow.